Want to hear what the whales are saying? Have you ever wanted to know what whales experience as they travel through their mysterious underwater realm? 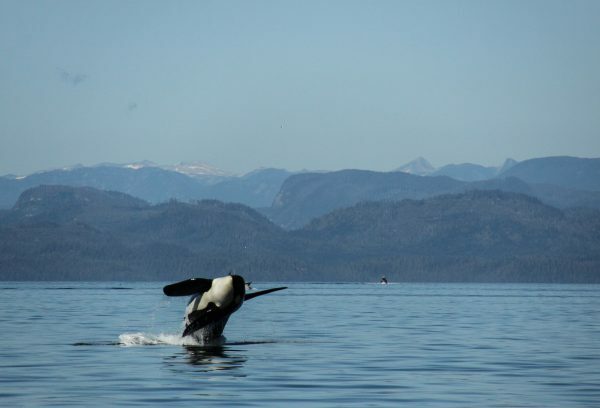 Well, read on, because while spotting an orca from your kayak on Vancouver Island is an incredible experience, it only just breaks the surface—literally!—of what makes these amazing creatures so fascinating. Did you know that different orca clans ‘speak’ different languages? 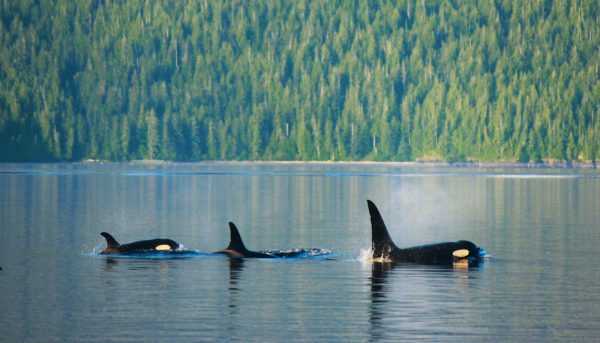 In northern British Columbia and Vancouver Island, we have three resident orca clans of whales, called A, G and R, with several smaller subgroups (‘pods’) among them. These pods, in turn, have their own specific sounds—like a dialect, or an accent! In fact, each orca pod has up to 17 distinct calls and whistles. It’s even possible for humans to learn to recognize these dialects; whale experts in northern B.C. can identify a clan just by listening, and some very experienced marine researchers can even recognize individual pods and whales. 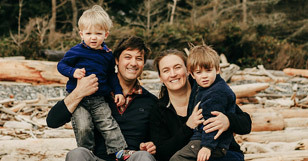 Most experts believe that having distinct dialects and languages helps to prevent inbreeding among the clans, and keeps the orca population healthy. And humpback whales have fascinating language structures, too! The humpbacks we see kayaking here on the coast of B.C. are the very same animals that gather in Hawaii during the winter months. But while the whales sing when they are in the oceans around Hawaii (wouldn’t you? ), they don’t sing while they’re visiting B.C. 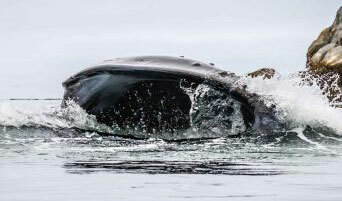 It’s not because they’re any less happy, of course (it is ‘Beautiful B.C.’ after all)—it just means that the whales’ song has very specific purposes, one of which may be to attract a mate during breeding season. But that doesn’t mean the humpbacks are silent while they’re here. On the contrary: they trumpet! B.C. is also the only place where humpbacks are seen doing ‘trap feeding’ – they open their mouths at the surface of the water and wait for unsuspecting prey to wander in… or even use their flippers to push prey in from time to time. The need for them to conduct these unique behaviours in peace is one of the reasons we give them lots of space when we’re out on our whale-watching kayak tours. All that singing, whistling and clicking isn’t the only sound orcas make. They produce plenty of different kinds of noise, too—we just can’t hear it. While those language dialects are used for socialization and communication, echolocation is a tool orca use to locate food (specifically, fish), and to find their way around as they travel through their vast, three-dimensional ocean realm. Orca echolocation is incredible. While it’s hard for humans to imagine, it’s almost like sight. The orca will release a kind of sound wave, or pulse, which will ‘bounce off’ different things and return back to them (like an echo, hence the name), providing them with a kind of sonic picture. In this way, they can calculate distance, ‘see’ ocean features and find food. 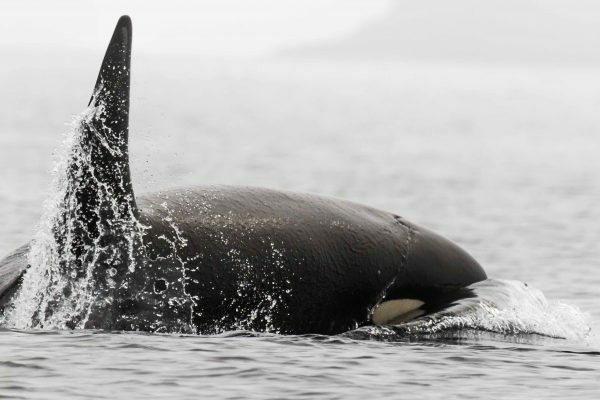 Echolocation is so precise that orcas can locate an object the size of a ping-pong ball from the distance of a football field, or even identify different species of fish. This helps them find and hunt the high-fat chinook salmon, which is their favourite thing to eat. As you can imagine, because of their reliance on language and echolocation for socializing, travelling, and feeding themselves, the ocean soundscape is very important to whales. This is one of the many reasons we give them a wide berth when we’re using motor-powered vessels, and it’s why we very much support the efforts of various ocean-reliant industries to reduce their noise pollution. Researchers are finding new ways to modify ship and engine design to help reduce human-caused noise in our oceans, and it’s our hope that these innovations—along with the continued efforts of all of us to minimize traffic in prime whale areas—will keep the oceans bursting with whalesong far into the future.